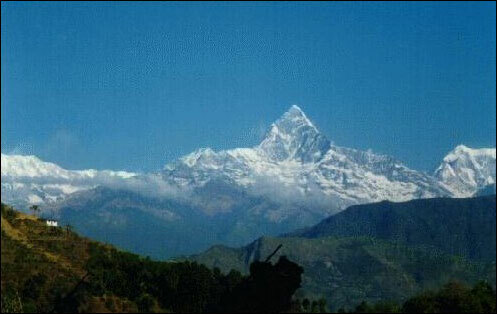 Travel-NEPAL.com, The Ultimate Site On NEPAL - Place To See - Pokhara. Known as the jumping ground for the best trekking in Nepal, the Pokhara Valley lies 200 kms. west of Kathmandu, enriched with gorgeous lakes and surrounded by picturesque mountains. Pokhara has always been a favorite among tourists visiting Nepal, to get away from the hustle and bustle of the capital to a peaceful setting, to relax by the lake side or take a hiking trip around the valley, with routes available to suit everyone's needs, ability and preferences. The valley is about 35 minutes abroad a plane, on about six daily flights available from Kathmandu or about 7 hours drive on a luxury bus. The city itself is divided into two zones - the lakeside and the bazaar area. The lakeside lies around the Phewa Tal, where most of the hotels, restaurants and tourist stores are concentrated. It is a place to relax before and after a long trek around the Annapurna range. One can just rent a boat and spend the whole day in the lake, sunbathing. As the jumping grounds for trekking, the stores around the lake carries all the necessary equipment needed for such trips, plus it is a good place to buy souvenirs to take back home. Pokhara also has the immigration office, one of the two in the country from where trekking permits can be obtained and visas extend. Pokhara has some interesting sites with religious significance like Varahi temple in the middle of the lake and Binde Basini Temple in the city, atop a small hill. Like the Tibetan camp in Kathmandu, Pokhara has its share of settlements, where Tibetan arts and handmade carpets can be shopped. Another one of Pokhara's attraction is the David's Fall. The best way to see the valley is pedaling on a rental cycle. The areas around the city offer some excellent hiking opportunities, with the valley on one side and snow-capped mountains on other, indeed a paradise for nature lovers. The most famous short route of all, the place overlooks the valley and an excellent place to view the mountains on the north. Just a couple of hours walk from the heart of the town, Sarangkot also has places to stay and eat. Beside the Phewa Lake, few kilometers away from the city, lies the Rupa and Begnas Lakes, a place to visit for the ones yearning to get away from the crowds.